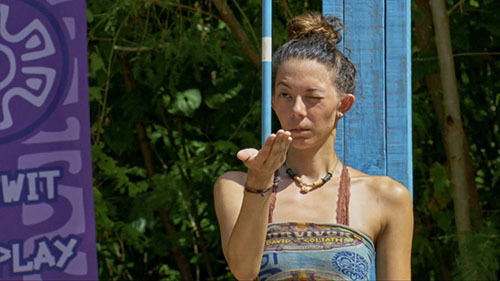 Yes, Gabby was the “nerdy girl” this season, an archetype we’ve seen on Survivor before. But like most of this cast, Gabby shined way beyond the “role” she was cast in. From the very beginning, she was the definition of a David. Her close bond formed with fellow nerd Christian seemed nearly too cute for TV. A few Survivor recappers (ahem) even tried to “ship” them, not knowing at the time that Christian is already in a happy, healthy relationship with his girlfriend, Emily (whom we got to see this week during the “loved ones” challenge). But romance aside, Gabby and Christian needed each other in this game. They formed a powerful strategic alliance that seemed to get them incredibly far in the game. But Gabby didn’t have plans to finish in second…she came out to win. She wasn’t wrong presuming that she would be perceived as Christian‘s “sidekick. So Gabby decided to make her biggest move yet: attempt to blindside Christian. It hadn’t worked out well for anyone else who tried to take him out thus far. With an Idol in his pocket, it would need to be orchestrated perfectly. Sadly, it was not. When Davie was looped into the plan, he clued Christian in which allowed Christian to play his Idol, saving himself. Even then, Gabby didn’t realize what was in store for her. She apologized to Alison, thinking that Alison was the one who would be sent packing. However, Mike and Angelina put their votes on Gabby. It was a huge swing and miss for Gabby…but as they say, you miss 100% of the shots you don’t take. Gabby Pascuzzi: I know that it has been a controversial decision because people are wondering if it was too soon, but conversely I was worried that if I waited, it would be too late. I think I would have regretted it way more if I would have missed my shot, and then who knows…I would be kicking myself so much more if I was sitting in the Final Three with Christian and being told by the jury that I rode his coattails, rather than I took a shot, I missed, but at least I knew what I had to do. And like I said in the episode, I did it with gumption. 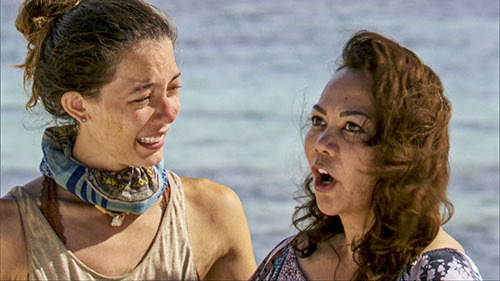 Gabby: I’ll use the word “disappointing,” because I think that Survivor fans are smarter than that, and I think that they showed Christian and my relationship as the platonic relationship that it is. He and I were allies from Day One, we lived together for 32 days. If you think I did not know about his girlfriend, asked him questions about his girlfriend, talked about her, said that I wanted to win the loved ones visit so that I could meet her, then you’re an idiot. We lived together for 32 days! So no, there were no romantic feelings for Christian, I’m sorry to all the Gabby-and-Christian shippers out there. But they should realize that these are real people that they’re talking about out there, and it’s insulting to not only me, but to Christian and his loved one, Emily, because you’re reducing such a complex, wonderful friendship and relationship into something so petty. We’re not in middle school. Women and men can have friendships. And what’s really insulting is that I can’t believe people would think that I would make a million-dollar-decision based on a romantic feeling knowing someone for a month. It just doesn’t even check out. So if you’re going to propose these crazy things, at least think it through and realize there’s no evidence there. Remember that you’re watching a Reality TV show, so trust me, if there was footage or evidence of that, you would see it! There was nothing to show because there was nothing there. For much more from Gabby Pascuzzi, including my full interview, please listen to the latest episode of the FilmSurvivor Podcast by clicking here. 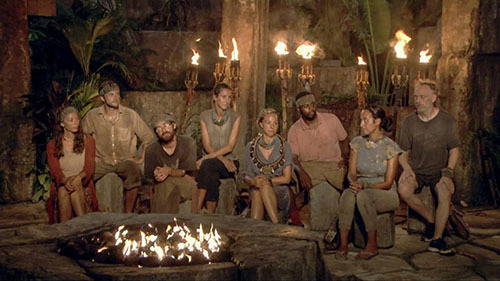 TELL US: WHAT DO YOU THINK ABOUT GABBY’S EXIT FROM SURVIVOR?